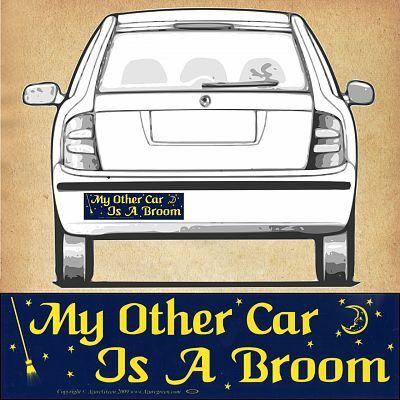 - Text reads: "My Other Car Is A Broom". Witchy women of all types will appreciate this little gem. Makes perfect sense, though. Do you know how hard it is to get groceries home from the store when you're on your broomstick? You'll have other drivers laughing and nodding their heads in agreement with this funny bumper sticker. "My Other Car…" bumper sticker measures 11 1/2" by 3". This high quality vinyl decal is resistant to UV and water, and is made to last. Do you have any other questions about our "My Other Car…" Bumper Sticker?